At the beginning there is inspiration and a lot of research. A whole range of different artistic impressions grow into ideas and we are allowed to dream. The beautiful buildings and surroundings create a special atmosphere. The details on the buildings are telling a story. 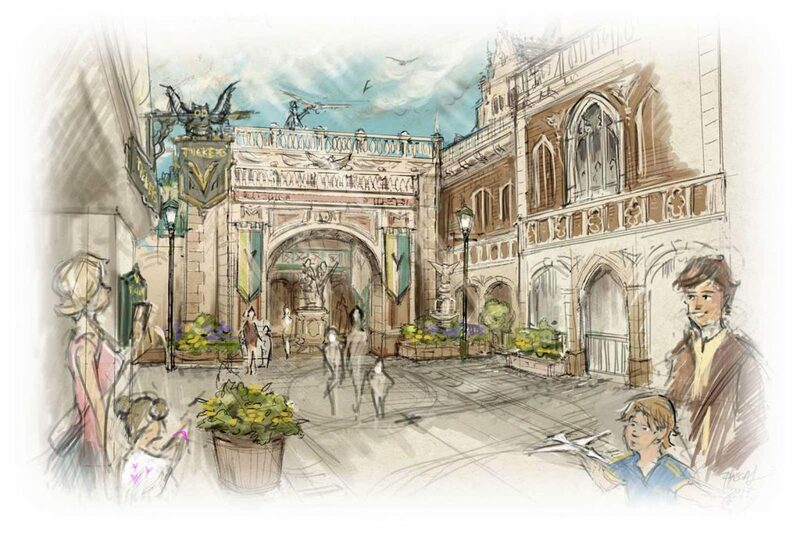 When the creative visionaries at Mack Solutions, Europa-Park’s design department, begin a project they first study and research massive amounts of references. Such can be architectural drawings, photos, films and even location scouts. The story of the attraction called for a large, historic European building that is located in a town or city, monumental and adds a strong visual presence to the scene. Structures such as the Manchester Town Hall, the Bremer Rathaus or the Rijksmuseum in Amsterdam were great inspirations. The goal of this research phase is to take in as many impressions as possible and open up to new ideas. It is also to build up a database of references which are very helpful in communicating ideas. In addition to studying buildings we also look at the areas surrounding them or leading up to them. Every building tells a story, therefore its setting and how you reveal it is equally important. Details define buildings and tell the story of when and why it was built. We studied countless crests, windows, pillars, tiles, roofs, ceilings, ornaments, and building materials to find the right look and feel for the project. After all the research is done our design team members begin dreaming up their own buildings. In this phase there are no limits. The goal is to get many different ideas on paper, to find the best ideas and to shape them into a clear and focused design intention that everybody can agree to. Many existing styles are mixed and matched to create a new yet recognisable architectural style. Aside from designing unique and beautiful buildings the Mack Solutions design team also envisions the atmosphere of the designed spaces. This adds life to the drawings and shows how the area can be experienced by the visitor. We call such drawings “mood renderings” or “moods” for short. Early design illustrations depict a town hall for the main building, an idea that was later abandoned in favor of the Voletarium institut. Close-up sketches are rendered for getting a better feeling of the environments. Specific questions such as “where can you purchase tickets?” or general questions as “will the idea hold up in detail?” are answered. No matter how outrageous an idea, in this phase everything is allowed. Sketching a blueprint and planning the layout is also essential to this phase. This creates an overview of the space and helps identify all the different areas for designing. Now that a design has been agreed upon, the designers at Mack Solutions furnish final detailed drawings with accurate measurements that serve as templates for construction. The building for the flying theater is not only beautiful but also one of Europa-Parks largest show buildings. At 15 meters height and 62 meters length it elegantly houses the attractions two giant, dome-shaped cinemas. A rendering by Pascal Schouten showing a top and side view of the queue line building. Many of the ideas helped inspire the final design. Now engineers come into the process, calculate weight, wind resistance, material durability, how many tons of concrete are needed, how long it will take to build, how much it will cost. When all the requirements are implemented a blue print for the builders is created and construction can begin. Buildings are rendered from every direction, construction and safety codes are applied. In this phase all final design choices are made, every detail is illustrated. Floor plans show the layouts and floor designs. In addition to looking beautiful an attraction building must fulfil countless requirements. Things such as exits, toilets, air conditioning, heating, lighting, power, fire department codes, safety codes and acoustics must be considered and planned.